Autumn is my favourite season in Auckland. Air temperature drops along with a number of people who get out to the beach. Ocean days become more relaxed. Star nights become even brighter. Endless road trips with friends or holidays times at the batch are almost over. It’s time for a different kind of fun. Festival Fun! Splore. Auckland City Limits. What else? A delicate feast of colour, creativity, positive vibrations, cross-cultural experiences and good energy come under Auckland Arts Festival. It brings multidisciplinary artists, creatives, collaborators from various parts of the world together and connects them with the local audience through celebrating diverse sides of art – dark and intimate, loud and playful, colourful and quiet, bold and engaging. The festival line-up inspires the audience to discover new things about themselves. If you were to choose only THREE events that you could visit this year, what will they be? If you are buzzing about something different this year than make sure to get in a sleeping capsule on a Friday night 16th March at Shed 10 where Max Richter will put a magic spell on you. If you are not ready to share that good night experience with a bunch of strangers accompanied by a phenomenal soundtrack, House of Mirrors should definitely be in your entertainment guide. You can walk along a wonderful industrial-looking maze with your friends and family. But also keep in mind that House of Mirrors is that sort of immersive and sensual experience that you can to share with one dear person you know pretty well. And this person is YOU. Who is the real Me after all…? If I was asked how I could improve that optical illusion experience, I would suggest cancelling all group visits and would make House of Mirrors a pure solo experience, giving each guest 15-20 min to solve the quest and find the way out. Step to the right. Next step to the left. You walk confidently as you think you get it. Suddenly you bump into your reflection in the mirror. What is it? It feels like you have been here before? You feel puzzled, maybe even lost but you keep going. You keep looking for the way out. And then you find the solution out of nowhere. House of Mirrors is an open-air installation, a unique adventure that provokes you to meet the hidden parts of you. House of Mirrors is a great metaphor on how you are getting on in life when you feel stuck or trapped. Do you panic and let anxiety overtake you? Or do you feel okay? Do you sit quietly in despair and wait until someone comes over to save you? Will you embrace your true and false selfs and keep on exploring? 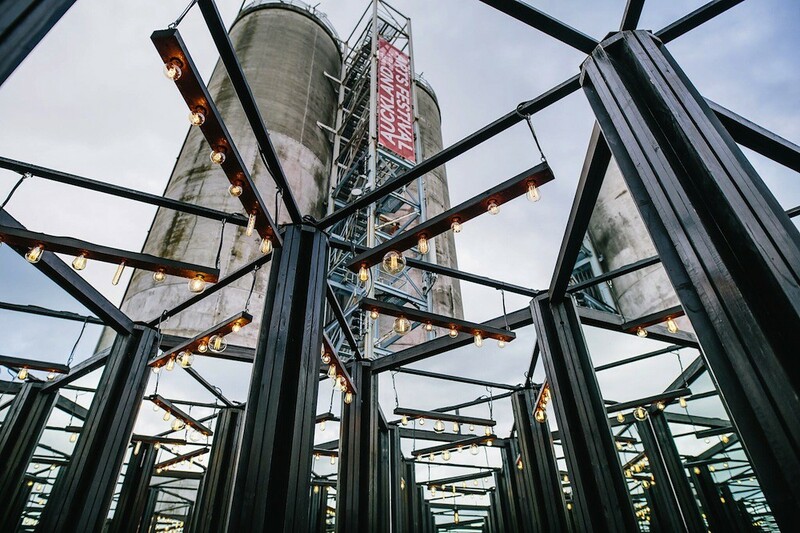 An outdoor gigantic 400-square-meter installation, House of Mirrors, designed and produced by a creative duo, Christian Wagstaff and Keith Courtney, hasn’t arrived from afar. It crossed the ocean and landed at Silo Park for a few weeks 8-25 March during Auckland Arts Festival. 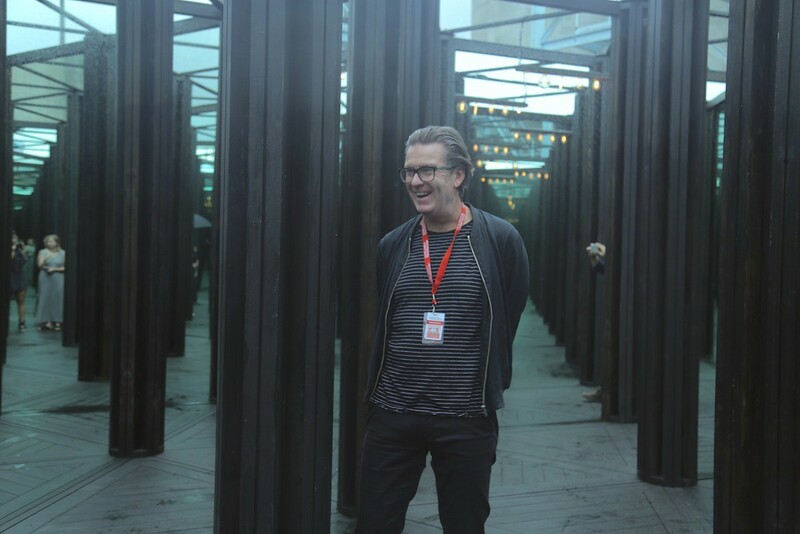 Melbourne-based artists needed 12 weeks to create the glass labyrinth after they pitched the concept to Dark Mofo Festival. Since the successful exhibition at the festival, they visited 7 cities and now made it to New Zealand. 40 tonnes of steel, 15 tonnes of glass crossed the ocean. 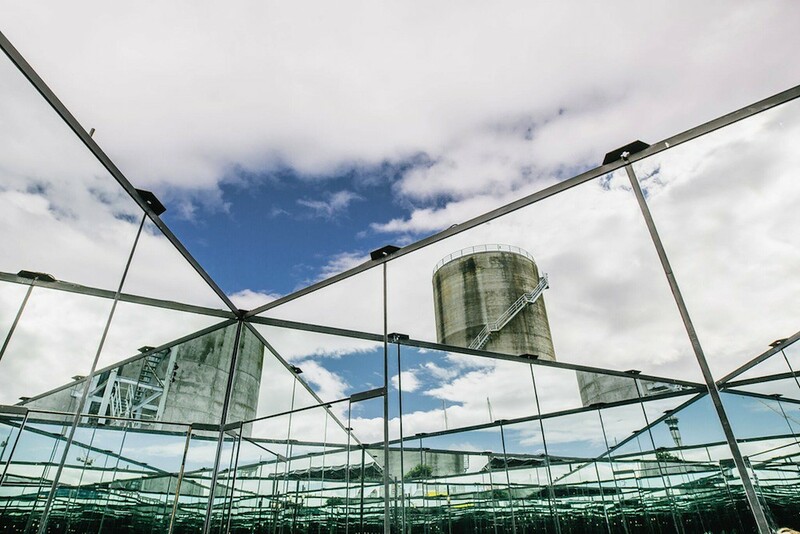 20 staff members were hired to set up House of Mirrors and one full-time cleaner is needed to maintain the beauty of reflections down at Silo. According to the weather forecast, this guy would be very busy during the festival. Disorientation, fears of all sorts, negative emotions, – those are a few concealed ideas that shape a solid creative fundament of the exposition. So if for some reason you deny the darkness within a human soul, you better watch out. But if you are challenged enough, feel free to check out House of Mirrors at Silo Park 8-25 March, $12.50 per ticket or at least read the interview below as we talked with artists, Christian Wagstaff and Keith Courtney, who explained why art should trigger darkest sides in a human’s spirit. How did it start? Where did you meet? How did decide to work together? Christian: We had some parallel lives. We are both from Melbourne and worked in theatre and entertainment industry for years. But our paths crossed at CROWN Casino where I used to work as a Creative Director. Keith: I was doing a photography exhibition and Christian got involved as the producer and helped me out with the project management and promotion. Christian: We did a few shows together back to CROWN. Then I went on my way and started a business. Later on, I invited Keith to join me, so we started the new business together. What is the best thing about your collaboration and partnership? Keith: I don’t think we ever feel any jealousy of each other. In a creative relationship that can be a real problem. We are free to criticise each other and be okay with that. Like Keith Richards and Mick Jagger from Rolling Stones in their partnership. For us, it’s all about respecting and responding to each other which involves an honest feedback. Luckily, we have similar taste in everything. We even order the same meal or a glass of wine in a restaurant. We have different personalities though, but they are complimentary. Christian: We both have skill basis and we bring different focuses on the project. We are both level-headed people. We can have big arguments sometimes that push through the resolution very quickly because of the balance and trust we have with each other. 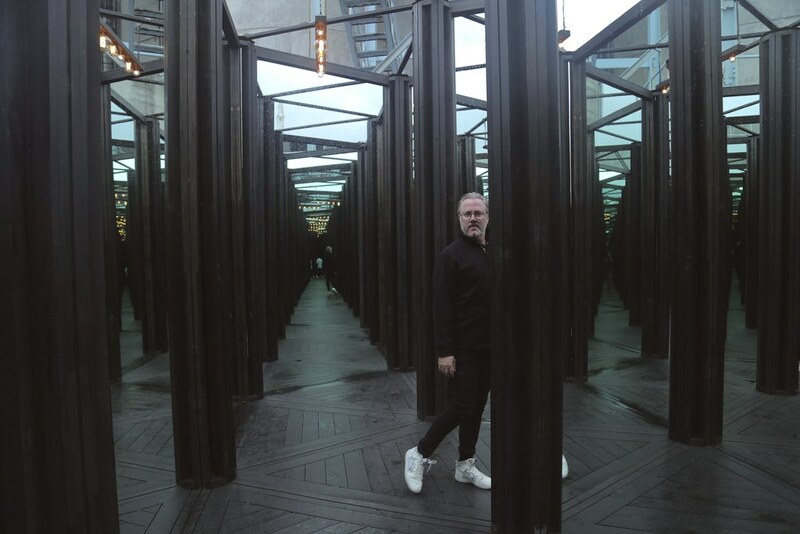 Talking about your latest project, House of Mirrors, it’s an interesting project that entitles both sides of art, both sides of the human emotional spectrum – negative and positive. Where is this idea coming from? Keith: The idea is inspired by the technology-driven society we live in now. The biggest motivation was for us was to create something that has Zero technology. An art piece that will be evoking a lot feeling, a series sensual effect within an individual. When people first walk into the House of Mirrors they looking for something they don’t necessarily find, cause they are looking for an amusement, wobbly mirrors, walking mirrors…but all we wanted to show them is the optical illusion that reflects their true nature. Christian: All the materials we used – timber, steel and glass, – are very significant in its ominousness, so it feels scary for people to approach it. We want people to feel a bit uneasy and different. It’s slightly an out-of-body experience if you give yourself some time. It’s an optical illusion that plays tricks on you. It rewires some pathways and renews neurons in your brain. That’s why people feel disoriented. Why is it important for you to give an audience that uneasy feel? To approach them to dark corners of one’s nature? Christian: Everything has to hurt, otherwise it doesn’t exist. Art should challenge you. But I think in the society we turn the back on the dark side of life, emotions and ideas. People are so focused on something uplifting, being happy all the time. Feelings of sadness, anger, sorrow, despair represent the other half of a human and we can’t ignore it. What we found during this experience in people’s reactions is that they experience the fear. We are not creating the fear. It’s just a House of Mirrors. But the fear that lives within them and I think that’s what especially powerful and interesting about this work. What was the most challenging during this project? Christian: Touch wood but it doesn’t have any major problems. Things just fall into the place all the time. I believe it happens because we felt 100% good about it, so our energy transfers into the project. In most of the commercial work cases there is something that you are not happy with, but here we are 100% happy with everything. It’s very rare. Keith: I would just change the logistical design of the installation. We could have used a lighter skeleton, but it wouldn’t be given the same FEELING to the audience. When you walk through the house, it is creaking and groaning, it’s a tactile experience. Timber on a steel gives you that Feel and you can’t find a compromise in terms of production when it comes to a delivery of that experience. Keith: Taking a risk. People don’t do it anymore. We take a lot of calculated risks. We don’t take risks where we are going to die. But we take creative and commercial risks. We didn’t know how much the project House of Mirrors was going to cost and it did cost a little bit more than planned (laughs), but we got here and it is all working out in a good way at the end of the day. Christian: I love my friends. They inspire me. It sounds a bit cliche, but it’s true. Good and bad aspects of my friends. I love to think that I have got a network of dear people around me who celebrate each other and also share some dark times together. My best friend died last year and it was a big challenge. And then we picked up a few cards from Love Game randomly. You can listen to the audio extract below. Question #1: Share 5 positive things about your partner? Christian: Loyal, very level-headed, private. I like he doesn’t say much to anybody unless he really means it and he won’t say anything to a person unless he trusts him. He doesn’t say much. Keith says a lot at work. And my partner doesn’t talk much. So it’s a nice balance. He is very honest. He is incapable of lying. Question #2 What do you love mostly deep about yourself? And how do you judge yourself the most? Keith: It is a difficult one. I’d like to think that I show a lot of empathy towards other people. I judge myself by being kind towards other people, you know. Being kind to everybody, the world around me and to the person, I just met.